Spray Rock Cottages Spray Rock Cottages were developed for an elderly population and as an important component of the Weekapaug Inn development plan on the oceanfront of Weekapaug village in Westerly, RI. The cottages are designed for year-round habitation but purchasers would also have the option of renting the cottages through the hotel as part of its inventory. Cottage owners would have access to hotel amenities including public rooms, dining, pool, spa and beach access. 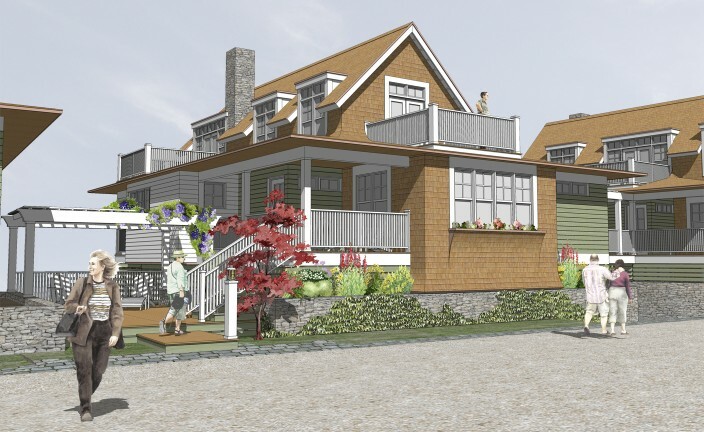 Many considerations went into the planning of the cottages including views from within, privacy for occupants, solar orientation, respect for site lines from neighboring properties, CRMC set-backs as well as flood zone elevation and construction requirements. Respect for the primacy of the main inn and its great lawn was another important factor in the siting of the cottages. To preserve and encourage the history of pedestrian access through the Weekapaug campus, vehicular access was hidden and private parking was tucked below the units, creating a better sense of community and transitional zones from public to private. Weekapaug Inn As part of a comprehensive development plan, LLB Architects designed an addition to the historic Weekapaug Inn, working with a broad team of consultants, including civil engineers, coastal engineer, landscape architect, and MEP consultants to redefine and reinvigorate this historic inn on highly-prized but very regulated oceanfront of Weekapaug village in Westerly, RI. The project included a new service addition with catering, dining, and entertaining facilities for functions ranging from small conferences to large weddings, and a series of five new cottages built above the flood plain. Planning and design included intensive study of the kitchen, back-of-the-house, and dining functions to accommodate year-round operation. 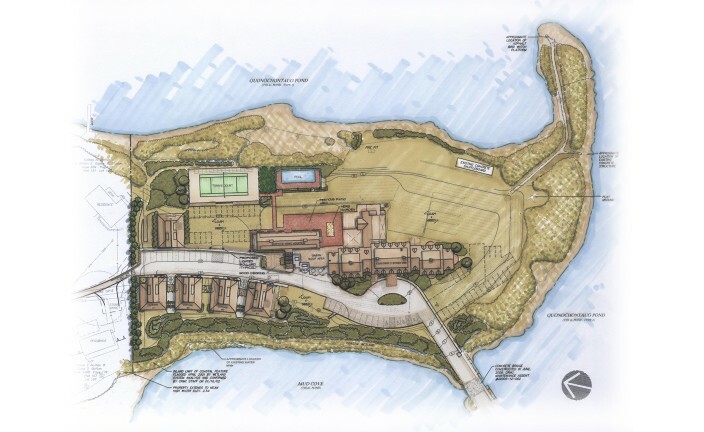 The site was to have state-of-the-art septic system, water management, FEMA remapping, ground-source heat pumps, and permeable landscape-parking areas. An extensive study of the views from neighbors' homes showed a sensitivity to the development's impact on the existing quality of life. It was designed to be LEED certified and the area is listed in the National Register of Historic Places. We worked diligently to preserve important aspects of design to remain and to ensure that new work was kept within the historic nature of the site. We worked closely with the following authorities, agencies, and organizations: Weekapug Fire District, Rhode Island Historic Preservation and Heritage Commission and Historic Peer Review, neighbors, DEM, CRMC, FEMA regarding Flood Zone, Westerly Planning and Zoning, RI State Building Code, RI State Life Safety Code, and USGBC for LEED Certification.